Since graduating from the University of Melbourne with honours, Dr Anna has worked in both private and public practices in country and metropolitan Victoria for 14 years. During that time, she has worked in country and metro Victoria, so there isn’t a dental problem she hasn’t seen and treated. Dr Anna is so passionate about dentistry that she has taught undergraduate students at her alma mater, volunteered at local kindergartens for over 10 years to help ensure more children develop healthy dental habits as early as possible. A member of the Australian Dental Association, Dr Anna ensures she stays at the forefront of dentistry and maintains her currency of practice by attending many continuing professional development courses. Anna has attended over 90 seminars, workshops and lectures by world renowned presenters on topics such as implants, cosmetic dentistry, veneers, and laser dentistry. 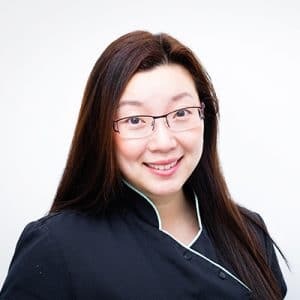 Dr Anna has a gentle, patient-focused approach to dentistry and a bubbly, warm manner that is loved by all her patients. She strives to make every dental visit as stress-free as possible and is always sensitive about assisting anxious patients during difficult procedures. If you have children, Dr Anna is the perfect dentist for you. She has two beautiful little girls of her own, aged three and five. Graduated from the University of Melbourne in 2005 with honours, and still teaches dentistry to undergraduate students at the institution. Was one of the top five students in her high school graduation year. She has worked across Victoria, including time at practices in remote regions of Victoria. Anna has volunteered her time to educating preschool-aged children about dental care at local kindergartens. She also volunteered in Hong Kong providing mobile dental help for the elderly. She is an expert in implants, cosmetic dentistry, and laser technology and regularly attends seminars, workshops and lectures to take part in discussion and increase her own knowledge. If you’re looking for expert dentistry delivered by a caring practitioner, you’ll love Dr Anna.